As of the beginning of April I will no longer be teaching a weekly Yin Yoga class on Wednesday evenings.Awwwww – I know!!!!! But it seems my passion for the practice doesn’t seem to be widely shared, so time to try something else. 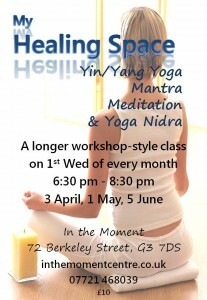 I am going to be offering a MONTHLY, two hour, workshop style class kicking off a whole range of offerings called “My Healing Space” . 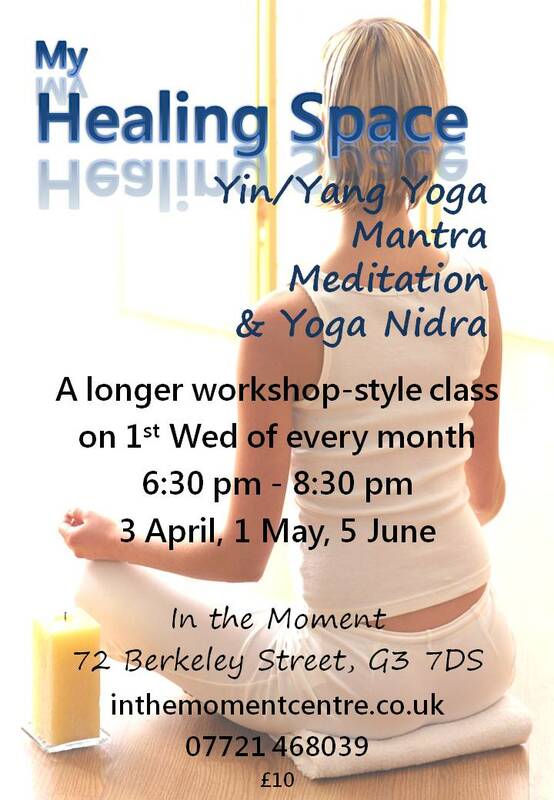 This class will feature Yin & Yang yoga sequences, plus mantra, meditation and the ever popular Yoga Nidra. Each workshop will have a seasonal focus. The cost for this two hour class will be £10. Those using their six class ticket will pay an additional £3 for the class. So, just what is involved? Yin & Yang Yoga – Mindful asana practice. Working with the deeper connective tissues and energy channels. Yoga Nidra – A deep guided relaxation technique, often translated as “Yogic Sleep”. Longer than the usual relaxation in class, usually 20 -30 minutes. We also work with “Sankalpa” – a resolve or affirmation. Deeply healing.